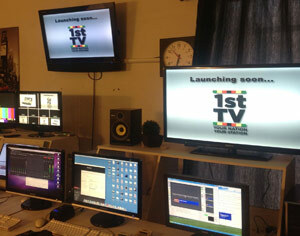 Zimbabwe 1st TV went live yesterday as promised. But they are not just beaming to free-to-air satellite TV decoders, the channel is available for online viewing. The channel can be viewed as streaming service you Ustream, viewed as recorded shows on YouTube, and followed on Facebook for some social interaction on the content they are beaming. The video streaming service can be accessed here: http://www.ustream.tv/channel/zimbabwe-1st-tv. We notice though that the service indicates “Off air” which means you’ll be watching recorded stuff for now. The YouTube channel is here: http://www.youtube.com/channel/UC5jB5WEGBlyFBnW0MUbB5FA. The name of the channel right now though is Tendai Gono, so we’re not sure if this is official or just a big fan spreading the content. On Facebook Zimbabwe 1st TV is available here: https://www.facebook.com/1stTV. Of course a new TV station beaming via satellite in a country where there’s only one broadcaster, a national one, is also a political conversation. We try to stay away from the politics here so you will have to Google for that kind of conversation. Image via “1st TV” Facebook page.